The Will Read and Sing For Food players will perform a public benefit show for Community Food Bank Thursday, Feb. 12, 7 p.m., at VUJC. The show is a unique mix of humor essays and live music. Since Oct. 2011, the show has raised $35,745 for local charities and causes; $10, 843 of that has gone to Community Food Bank, the biggest recipient of the show’s total donations raised. Scheduled performers are humor essayists Scott Saalman and Angie Mayfield and musicians Wade Baker, Kyle Lueken, Marc Steczyk, Megan Gatwood, Carley Knapp, Ed Walston, Debbie Schuetter, Carley Knapp, and Bryan and Jaime Bolin. The show will be held in VUJC’s new Center for Technology, Innovation & Manufacturing Theater. Admission: $10 or more donation at door to Community Food Bank. Latest column for the Herald. 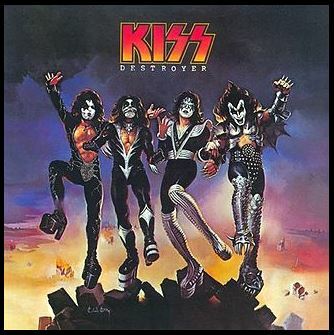 My first-ever 33 1⁄3 long play (LP) vinyl album was KISS Destroyer. It was the first present I unwrapped on Christmas Eve night 1976. There was also a second to unwrap: Cat Stevens Greatest Hits. After opening those two presents first, the surprise of my next present was pretty well spoiled: my first turntable. The blue turntable had detachable speakers, their cords long enough to put one speaker on one side of the room and the other speaker on the other side of the room for full stereo effect. My first, very own record player! No more having to use the family stereo console, which was made of wood and was nearly as long and deep as a coffin, to play my 45 rpm records. KISS. Cat Stevens. Talk about musical contrast. Hard rock versus folk rock. Four face-painted devils on one shoulder, a bearded angel on the other, all imploring for my attention. I was an altar boy, but the temptation of my first KISS got the best of me. I always followed up with Cat Stevens, though, as if performing an act of contrition. I had already owned an 8-track tape player (first tape: Jim Croce’s “Life and Times”) and a cassette player (first tape: Elton John’s “Greatest Hits”), but the sound quality of those music mediums — always emitted was a hellish hiss — were far inferior to that of a turntable, which delivered a rich, raw crispness and cherished crackle. The boom in popularity of the compact disc player in the mid-1980s delivered the demise of record collections everywhere. My first CD: Paul Simon’s “Graceland.” Of course, CDs have suffered great casualties in the music industry wars as of late thanks to mp3s and online streaming, both of which I support. The last time I saw my record collection was just before my divorce. I was in the attic picking out things that made sense to carry with me into my new life. The record collection, still in dad’s wooden crate, did not make the cut since most of the records had been replaced with CD counterparts. Later, I learned my record collection migrated to an ex-in-law’s yard sale. What great item did I ultimately pillage from the attic? — a toaster, since it was a duplicated wedding gift. Sometimes wedding gifts end up becoming unintended divorce gifts, which can be a good thing since they end up saving one member of the party money at a time when he or she really, really needs it. There should be a divorce gift registry. Oddly, in the past few years, there has been a slow resurgence in interest for LPs and turntables in the U.S. This Christmas, I bought my son and daughter each a turntable (the first for both) since both have long collected LPs but have never heard them play. Delaney has them hanging on her bedroom walls as decorations: The Beatles, The Beach Boys, The Everly Brothers, Dion, etc. I also bought both of them unplayed pressings of The Beach Boys’ “Pet Sounds,” which is the real reason record players were invented in the first place. Austin also received Miles Davis’ “Kind of Blue,” a turntable no-brainer for my jazzy son. At about 2 a.m. after Christmas, Delaney and I listened to her old records. It was nice to share the sight of an LP spinning, and though some of the records were slightly warped, the needle still rode their wavy grooves without fail. It was nice to share the still crisp sound of songs from very old records, from the The Beach Boys’ “God Only Knows” to Johnny Cash’s “Wanted Man” to The Beatles’ “Two of Us” to The Everly Brother’s “All I Have To Do Is Dream” to the Eagles “The Greeks Don’t Want No Freaks,” their needle-gnawed crackles a comfort food for my ears. It was nice to share music the way it was meant to be shared. I felt waylaid, ambushed. Others around us during the inquisition intently awaited my answer, as if I was about to confess to the murder of the century. It was like that infamous Sharon Stone interrogation scene in “Basic Instinct,” except I wore underwear — which suddenly felt surprisingly tight. I know of no one who would answer “no.” Well, other than if you are sick and the last thing you want to do is eat something — likely the whole reason you are sick though is because you like to eat. My dad shared a food-related horror story with me not long ago, a retelling of a supposedly true tale he heard a guy tell. My dad said the guy said this guy was eating crab at a seafood restaurant. He cracked one open and suddenly a bunch of tiny baby crabs birthed from its shell and scuttled across his plate. I bet, at that moment, had you asked the guy if he liked to eat, he would have screeched “no” just before projectile vomiting across the table. I wasn’t going to lie to my high-school best friend’s mom, even though I haven’t talked to him in decades. No one around us seemed surprised by my response (was it that obvious?). No one gasped like they might do learning that Colonel Mustard killed Mr. Boddy in the Library with a Lead Pipe, which could really happen. Question: Do colonels naturally keep a lead pipe in their possession? I’d ask Mr. Boddy, but he’s apparently Dewey Decimal dead now. I bet Colonel Mustard died not long after from lead poison after carrying a lead pipe all the time. Colonels should carry a candlestick. They can still do skull damage with it — or singe someone’s eyebrows — and live long enough to get a government pension, unless opposing armies find the candlestick more comical than threatening, break into a spirited Disney-esque rendition of “Be Our Guest” just before beating the colonel to death with lead pipes. My high-school best friend’s mom said other things too, but I can’t recall what — maybe she asked about my kids, my marital status, my job — because all I kept seeing in my mind was her lips forming the same question, “Do you like to eat?” in incessant instant replay mode. Oh, she also laughed after asking, as if it was just harmless good ribbing between old friends, the two of us in on the same joke that instantly ate away at my self-esteem. Of course, the “you’ve put on some weight” precursor to her question was not lost on me either. What was her benchmark? — high school? I was a scrawny 118 pounds when I graduated. Two slices of pizza filled me up. Now, I can eat a whole pizza. So, sure, I guess (I know) I have gained weight since then. Do you like to eat? Do you like to eat? Do you like to eat? A couple years ago, I finally ran out of notches on my trusty old belt. Belts don’t lie. I bought a new belt, slightly bigger than its predecessor. Could she tell my belt was fairly new? Is that what prompted her question? I have also conducted internal debates lately about whether to undo my belt while driving — and I don’t mean my seatbelt. What if I did undo my belt and was pulled over? There’s no way a man can talk his way out of that one, though he’d likely not get frisked. Me: Because you smelled that rotting corpse in my trunk? Policeman: No. You just looked too comfortable driving. You obviously have your belt undone. I’ll let you off with a warning this time. Now put that belt back on. Policeman: Say, what’s that horrible smell anyway? Me: Uh . . . uh . . . my catalytic converter? Policeman: Jesus, son. Get that fixed. It’s like somebody died in here. A photo was taken after our conversation — or my high-school best friend’s mom’s conversation with someone pretending to listen. She said her son would get a kick out of seeing it. Seeing what? That I’m obviously a porker now? I sucked in my newly-discovered gut and waited for someone to tell me to say, “Say cheese.” Although, to me, it would’ve sounded more like, “Do you like to eat cheese?” making me break down and confess aloud, “Yes! Yes! I like to eat cheese!” Who can say “no” to that question? Scott Saalman and the Will Read and Sing For Food players will perform a public benefit for Habitat For Humanity at 3 p.m. on Sunday, Jan. 18, at Kimball International Auditorium, 1600 Royal St., Jasper. Special guests are Wade Baker and Channing and Quinn. Admission is $12.